Classic Cartoons: Take this CGI!! If you think the facial expressions of your "Kung Fu Panda" can equal the ones of the greatest panda ever on screen, Andrew P. Panda, you don't need to see singing frogs to be escorted to the nearest psycopath hospital. I'm not showing Marc Anthony's Oliver Hardy-like superb takes to save any computer animation blind follower (if any visit this blog) from additional embarassment. Sheesh! I happen to like "Monster's Inc." homage to "Feed the Kitty". It's not like it was a throw away pop culture gag like in some other studio's films or "Family Guy". Man, has summer become "Let's Us Blogger Bash Pixar season"? It sure feels like it and I'm sick of it. Andrea, please don't make this blog exactly like Thad's or John K's blog. I'll start losing intrest in this blog just like the two formers. Okay, I'll get off my soap box now. I'm making this post because today all TV channels here in Italy were celebrating "Kung Fu Panda" and I wanted to make clear once again my old fashioned point of view. I don't want to do my blog like Thad's or John K's. I wouldn't be able. The first one identify animators that I cannot and would never dare, the second explains "how to animate" and I have no such knowledge. I just post here anything related to classic cartoons and Golden Age funny animals comics that I find worth the post. This post is not against CGI, it just shows the superiority of traditional animation, something everybody should have to agree with, in my opinion. DAMN, I love Frank Tipper's animation of Pop Panda in Knock Knock and Andy Panda's Pop. Oh and I thought Monsters Inc. was soooooo cute. Okay, I get it now, sorry. Though I have to admit that I took Jerry's advice and went and see "Kung Fu Panda" and thought it was the best film Dream Works did and not because of the voices but the story. "Acting" and attempts at "character development" in Kung Fu Panda were utterly bland and corny - just it had something to replace it. When those animals start killing each other it looks amazing, but when they start to act out about their dreams and crap it's corny and awful as any feature. I feel the amount of corny stuff here was pretty reasonable, but of course it could have been done better. The entertaining parts were awesome! All those bland features with propostorous stories should learn from the Superman - less acting, more action and the fun stuff. I prefer character cartoons myself, but Panda was a step up for the features. My sister(teen) said she hadn't believed she would have liked a CGI cartoon. She likes cute stuff. Oh boy, all this talk about Kung Fu Panda is really disrespectful to the Woody. I've come here to copy some drawings but I've watched Kung Fu Panda a few hours before so I had to get it out of the system. These expressions are so fun! These are nice frames of Andy Panda's dad. I agree with you that these drawings show how pliable and expressive hand drawn animation can be. 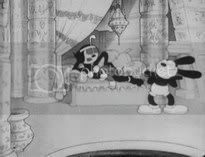 However, the actual animation in the early 40's Lantz cartoons, including the examples you provided, were slow and a little sloppy. It wasn't until Shamus Culhane started directing at Lantz that the animation started to improve. It's a little unfair to compare hand drawn cel animation with CGI animation. CGI is closer to stop motion animation, so perhaps it would be better to compare today's computer animation with yesteryear's Puppetoons, or something like Corpse Bride. Each medium, though, has it's assets and limitations. CGI bites - it's headache-inducing and done to make a quick buck, pure and simple. There's no love or artistry involved. I'll stick with the classic traditional hand-drawn product, thank you very much. I don't own any CGI garbage, not do I ever intend to in the future. For those of you who enjoy it, please continue to do so - Andrea's postings only prove to me how great the classics are - at least those animators had talent IN their hands and not AT their hands in the form of a keyboard. The answer to the too-much-CGI problem is very sad I 'm afraid. CGI can pull out a good puppet design but can't move it as fluidly and as beautifully as traditional animation, right? Well it seems nobody alive today could pull it out in 2d either. Don't know about you guys but I would take CGI over Bambi 2 and their ilk any day. It's just depressing. I hope funny cartoons will be reborn in the future... I don't care about features that much anyway. I'm forced to make such a comparison because CGI is indeed taking the place of hand drawn animation. The Andrew gallery was funny enough, but your opening statement referencing singing frogs almost had me crying with laughter. And Pop was a riot right from the very first one in which he is a W.C.Fields-esque character, David! I mean "Mouse Trappers", one of the Lantz short I really love. I hope a future third Woody set (if we'll have it-I still don't know how many consequences that Universal fire of months ago will have on this posible release)will include it. I bothered enough Jerry about it that I guess it will finally be on set (let's just hope in a non muddy print). Hell yeah, look at those wrinkles! Super expressive drawings are fun to look at. That said, Pixar's Presto short has let me see the possibilities of extreme emotion in CGI so little by little they are getting better at it. "Way Down Yonder in Corn"
"You can't catch anything, can ya?" "Fadder Time" would love this!